Simply the best way to start Pilates. Get to know the the insights of the Pilates method in a 1 on 1 setting through personal guidance with our experienced Pilates experts. ** These offers are EXCLUSIVELY for FIRST TIMERS! Pilates Station is the first Pilates Studio in Bangkok opened since 2003. 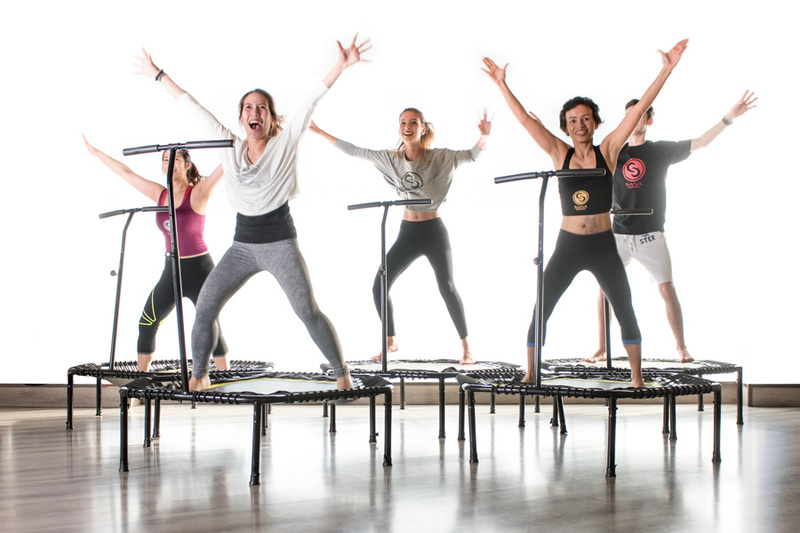 It was founded by Patricia Duchaussoy, International Pilates Master Instructor. The studio is fully equipped and committed to highest quality teaching of the REAL Pilates Method. The studio is home to international Pilates Education Programs organized through the Swiss Pilates Institute and BodyFly Academy. The Studio therefore offers regular Pilates and BodyFly Classes, professional Teacher Trainings as well as its own line of Pilates Equipment. We are proud to have positively impacted the life of thousands of people in Thailand and Asia over the last 20 years. Pilates is unlike any other exercise you may have tried before. It is safe and gentle and it can adjusted to exactly your needs. It is a full body-mind exercise that focuses on strenghtening the core muscles. This leads to excellent results for a healthy spine and posture and it creates nice and strong muscles without building up bulk. Proper alignment is balancing your skeleton. Your muscles are in the ideal length without any tension. Improper alignment is reducing your body’s ability to cope with gravity. This results in aches and pains and limited ability to move. Pilates gives you an opportunity to learn to correct your misalignments and allow your muscles to work as efficiently as they should. Pilates strengthens the whole body, targeting each muscle group evenly with a mixture of dynamic and static strength training. Over time, you will see your muscles gaining tone and looking sculpted, but you’ll also feel much stronger and more energized. Flexibility is essential for your overall fitness and vitality. Pilates is the perfect exercise regime to achieve good balance between strength and flexibility. 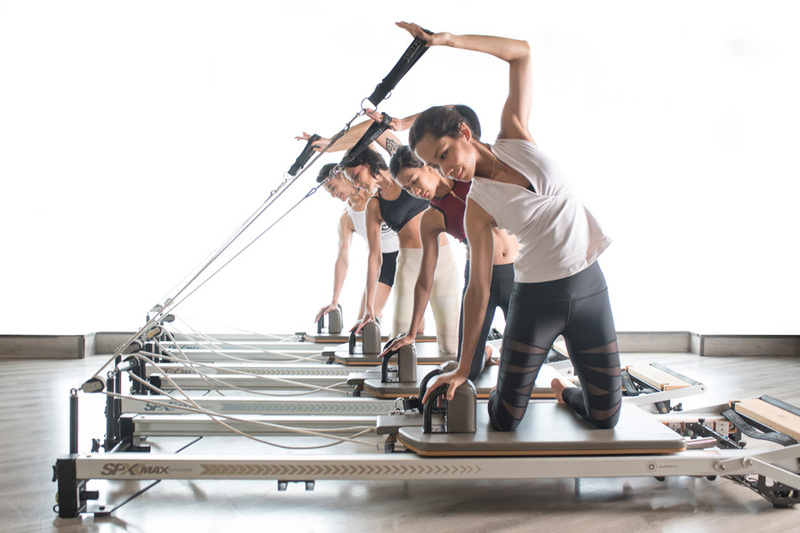 Pilates on the Mat and on the Equipments is designed to train every part of your body evenly – front, back, and sides. Muscles respond quickly to regular exercise, and after a few weeks of Pilates you should notice visible muscle tone and see your body begin to evolve. While improving your concentration during exercising comes naturally through regular practice. Pilates builds stamina, not only physical, but mental. Stress is one of the biggest negative factors of modern life, affecting your physical and mental wellbeing. Pilates focuses on breathing – a deep, mindful pattern of breathing that instantly enhances feelings of calm and release in the body and mind. You will find that your sleep will improve with regular Pilates, which will greatly reduce any fatigue and stress. Pilates and Yoga are different yet very complementary. Practicing Pilates can help yogis enhance their practice by correcting their body alignment, improving strength and flexibility. Yoga is a spiritually based movement practice that uses breathing, meditation, chanting, stretching and careful control of the body by focusing the mind to achieve enhanced states of consciousness. The most popular types of focus on moving slowly into a pose and holding the pose while taking slow deep breathes in order to achieve a quieting of the mind. Pilates is a movement based practice and uses breathing, stretching and careful control of the body by focusing the mind. Pilates concentrates on abdominal strengthening and functional use of the muscles and joints. The focus is on proper body alignment and the ideas of stability and mobility to teach practitioners how to keep themselves from being injured. 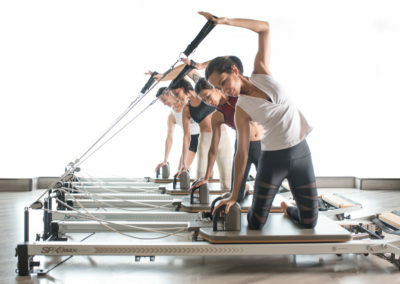 Why is Pilates more expensive than the average exercise class? A highly qualified teacher goes through a very intense program with many hours of lectures, practical work, practice teaching and observing. Pilates Instructors are movement specialists rather than class instructors. This deeper level of training will help you make changes within your body. Think of the costs that you may incur from regular physiotherapy or chiropractor treatments. What is the best way to get started in Pilates? We always recommend starting with at least three private sessions. This gives you the opportunity to learn the principles and fundamentals of the Pilates Method from the start. This way, you have a deeper understanding of what we are asking for once you are in a group setting. It also gives us a chance to focus on what your body needs, teaching you of any imbalances or patterns that are not feeding your body well and possibly causing pain. Best t wear formfitting clothes so that your posture can be easily visible by both yourself and the instructor. This way, proper correction can be done if required. Even if you typically prefer loose-fitting workout wear, you’re going to want to wear body-hugging options for Pilates classes like leggins with a tank top or fitted long-sleeved shirt. As for footwear, you can either be barefoot or wear socks for your session. If you’re going to go for socks, find yourself a pair with rubber detailing on the soles so you don’t slip on the mat or machine. Exercising at the Pilates Station has helped me such a great deal to keep my body in shape and improve my posture. Especially the sessions with Master Patricia were excellent and her passion and knowledge for Pilates is absolutely unique. I have trained with Master Patricia at the Pilates Station. She has inspired me so much, that I started to do Pilates on a daily practice to make sure my body stays firm and strong. Pilates Station is certainly THE PLACE to exercise Pilates.